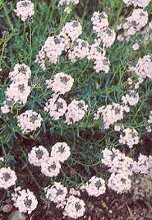 Hardy perennial rock garden plants 6-12 inches in height with wiry trailing stems and candytuft-like blooms in early summer. The plant belongs to the Mustard family (Cruciferae) and are natives to Iran, Iraq, Armenia and other mid eastern countries. Plants can be propagated by sowing seed, or by taking cuttings in the early spring. Seed should be sown in pots, trays or prepared beds in a soiless mix (1 part sphagnum pea to 1 part sand is fine) and barely covered, or pressed lightly into the medium and then covered with glass or clear plastic. The planting medium should be kept moist but not soggy and temperature should be maintained at 68-75F. When most of the seeds have germinated, the glass covering can then be removed to allow greater growth. When the seedlings reach about 2 inches in height, they should be transplanted to larger containers or outdoors if the temperature does not fall below 65F. Cuttings can be taken after the plants bloom in the spring, from new shoots. They may be stuck in sand and kept moist and will soon root. Once well rooted, the plants can be moved to larger containers or outdoors if the temperatures do not fall below 65F.